A new brand of outdoor gear that's launching with Shuttlepack - a daypack that you can move from your back to your front in an instant. Click on the images below for more videos and information. Hawkmoth is based in West Sussex, England and is a new brand of outdoor gear. Our aim is to provide kit that makes you smile and we're kicking off with Shuttlepack which was developed with support from the Design Council Spark 2016 programme. It's likely we'll be going down the crowdfunding route following further testing and development, so please get in contact to register your interest or follow us for all the latest updates. If you can spread the word about Shuttlepack, that would be amazing. For any enquiries, or to register your interest, please drop us a line. Alternatively, follow us on one of the platforms below for the latest updates and developments. Copyright © Hawkmoth 2016. All Rights Reserved. 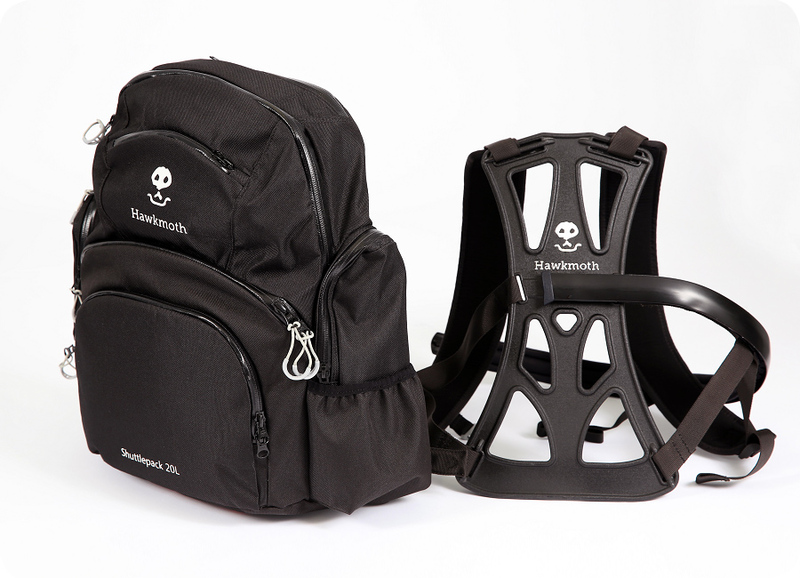 Hawkmoth and the Hawkmoth logo are registered trademarks owned by Informed Design Consulting Ltd.
Shuttlepack consists of two parts, a bag and a harness that has a rail attached. * The bag slots onto the rail and can be moved around the body. 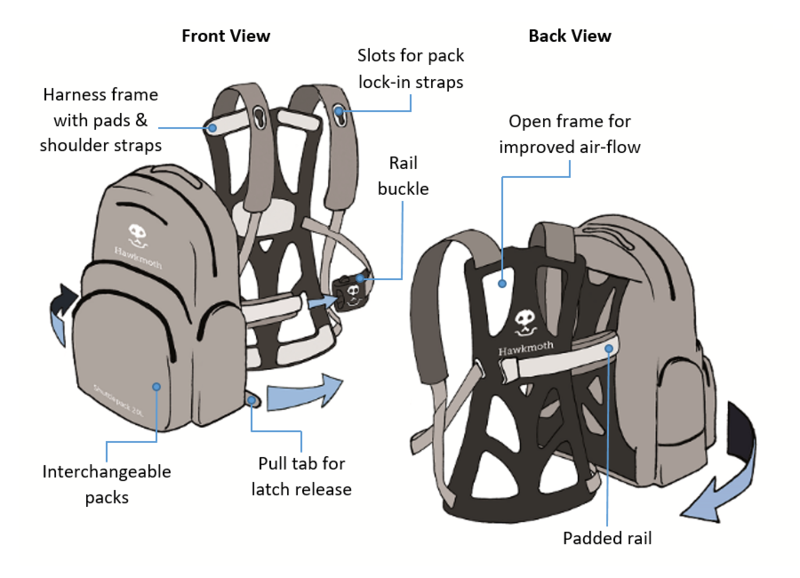 Different Shuttlepack bags and attachments will become available which you can slide on and off as required. One day you might want to use a bag designed for a city commute, the next day you might switch to your ski bag for a trip to the slopes ... the possibilities are endless. *Harnesses come in a range of sizes for a better fit. As well as handy side pockets, Shuttlepack has two main compartments that are separated by a zipped divider. The shallow top compartment helps you access your items quicker and there's also a soft pocket for your phone. The A5 pocket is ideal for a small tablet, book or Kindle and if it starts to rain, quickly attach the rain cover and then return the pack to your back. If you're wearing the bag at the front for any period of time, secure it to the shoulder straps with the concealed lock-in fasteners. Additional features of note include the option to interchange different packs and attachments and an open frame to allow increased air flow to your back. Shuttlepack will appeal to a variety of user groups. To name just a few: Walkers and Cyclists - regular access to drinks, snacks or phone; Commuters, Festival Goers and Tourists - secure the pack on the front when going into crowded areas to deter pick-pockets; Keen Photographers - rapid access to camera, lenses and filters; Skiers and Snowboarders - move the bag to the front before getting on ski lifts; Parents with Young Children - be prepared for every demand or incident! Shuttlepack was developed as a concept when Simon Foxhall became a Design Council Spark finalist in 2016. Spark provides funding and design support over a 20 week period to develop innovative products. Find out more about Spark here. 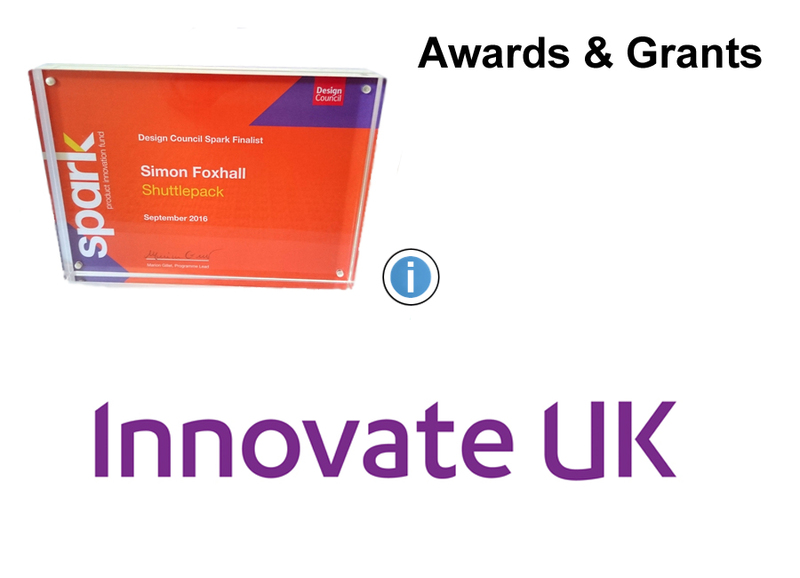 Shuttlepack has also recently been awarded a grant from the UK's innovation agency, Innovate UK. The Foundations project is being co-funded by Informed Design and will investigate specialised packs and devices that can be offered as part of the Shuttlepack system.